The hallmark US-India Innovation fund was launched today promoting entrepreneurial culture and innovation partnerships between India and the US. It’s an initiative of the two governments come about as an effort of the Wadhwani Chair in U.S. India Policy Studies, Center for Strategic and International Studies (CSIS). The Wadhwani chair has been funded by the Wadhwani Foundation, established by Silicon Valley IT billionaire Dr. Romesh Wadhwani in 2000. CSIS is an American think tank. The launch was attended by notable guests H.E. Mr. Richard Verma, US Ambassador to India, Dr. Elizabeth Sherwood-Randall, Deputy Secretary of the US Dept. of Energy and Mr. Eric Alexander, Head of Business for Uber Asia. 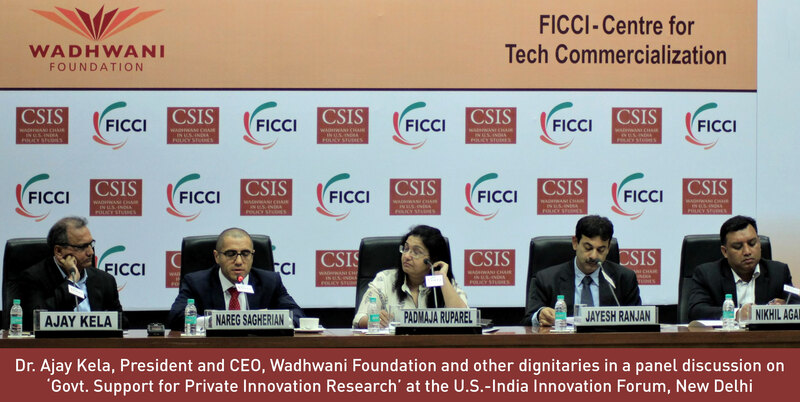 The Wadhwani Foundation dedicated to accelerating economic development in emerging economies through large-scale job creation, aims to do the same through this innovation fund. Wadhwani Foundation has set the goal of helping create and fulfil 25 million high-quality jobs in India in 5 years. This will be through three verticals: Innovation of ecosystems, strengthening University Research Networks, advocating for Government Support for Private Sector Innovation Research. “However the best is yet to come”, he said, signalling the change in pace of innovation and economic development created by the startup ecosystem. “15% of Silicon Valley startups are run by Indians. We can’t afford a normal path of development…two thirds of India is to be built by 2030. While the passing of GST bill, bankruptcy bill, and increasing ease of doing business and investing, the government needs to continue to do more in terms of reforming policies pertaining to IP (intellectual property). A climate for businessmen to invest here must be created.” Mr. Verma concluded by announcing the Global Entrepreneur Summit to be held in India, an event that was already held in Northern California which will potentially attract entrepreneurs from all over the world. Steve Alexander, Head of Business for Uber Asia, in his address spoke of Uber Exchange, a mentor program where from 1100 Indian startups, 10 startups will be selected, flown to meet and learn from the Uber team headquartered in San Francisco to receive help with developing their business plans and meet with investors for potential investments so that these Indian entrepreneurs can come back to India and create successful businesses that will create jobs in local industries. The US-India Innovation Fund has been sponsored by Uber, Coca-Cola and Qualcomm. Notably no Indian behemoths are part of the sponsorships or present as speakers. When queried, Mr. Atul Raja, Executive Vice President of Marketing for the Wadhwani Foundation said it was more fitting to have a representation of American companies while the guests attending – businessmen and women, academicians and media – represented the Indian part of the forum. It is also worth noting that such a forum is launched at a time when most Indian startups, unicorn and downwards, are suffering from over valuation, lack of funding, down turns and acquisitions/distressed selling. An increasing dependence on foreign companies does not come for free as the Indian market will grow in strategic importance for said organizations. Leading Indian entrepreneurs like Deep Kalra, Group CEO of MakeMyTrip believe Indian startups don’t even have a fighting chance to survive with the government doing all it can to invite large foreign startups and companies to enter the Indian market and take share from Indian players (ex. Ola vs Uber). “If we can’t have some protection from the government, can we at least have a level playing field? Because foreign companies have more reprieve than local startups do” Mr. Kalra recently said at the BW Businessworld Golden Cart Summit and Awards. As Mr. Atul Raja puts it, “the US is king of innovation”. It’s a home truth that rules out keeping away American companies to protect local ones as these will be the very companies the US-India Innovation Forum will invite to drive innovation across India. We [Indian companies and startups] must learn to compete with all players. However this forum is a tie-up that benefits both countries, each country brings crucial assets required for innovation. “America has the technology, India has the man power”, Mr. Raja said. and developing countries or poor, seems a true difference.